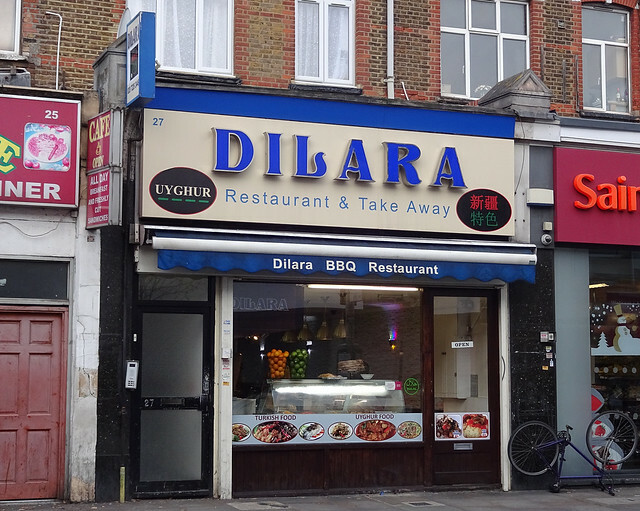 This week's featured article is Dilara/Uyghur Restaurant in Finsbury Park. Don't be deceived by the signage - this ain't no standard kebab shop (though it does have kebabs on the menu). Peer beyond the entry to discover a be-chandeliered restaurant with plenty of seating, serving a variety of Turkish and Uyghur cuisine. 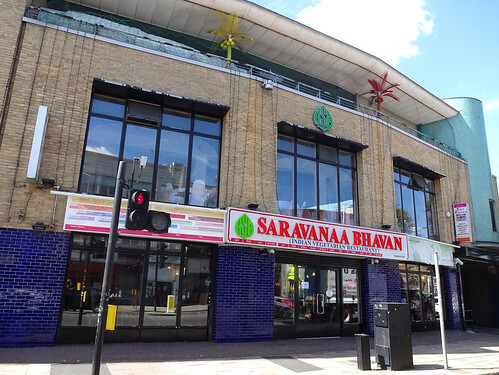 Our reviewer was impressed by the quality of the marjan korumisi - stop by and you may end up getting a freebie with your meal. 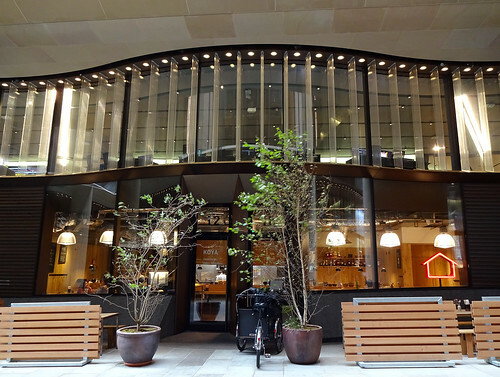 Fans of chickpea-based scran will be saddend to hear that Hummus Bros has gone into administration, closing all their restaurants including the Wardour Street and Southampton Row branches. 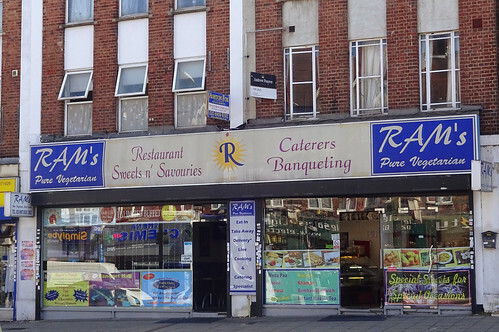 Also permanently closed is Caprice, a Balkan and Mediterranean restaurant in Croydon's High Street. Evening all! 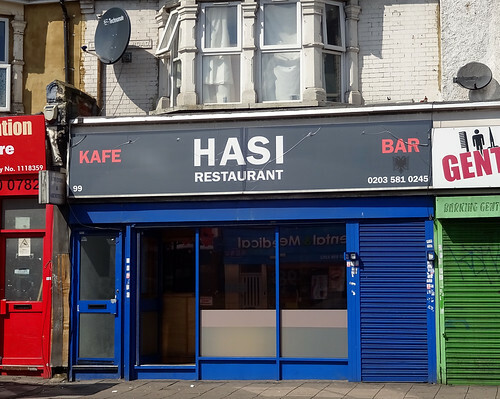 We're back after a week off, with another featured article: Hasi is an Albanian restaurant and bar in Barking, with no discernible menu. Sounds like the food was tasty though, so certainly worth checking out if you're in Barking and/or want to brush up on your Albanian current affairs. Two new pages this week! The Pan Tao Garden stall in Tooting Broadway Market serves boxes of extremely good value (if not particularly adventurous) Chinese food, while the Oasis Cafe in Thornton Heath has both British and West Indian menus (including a West Indian breakfast) - no Gallagher brothers sighted on our visit however. 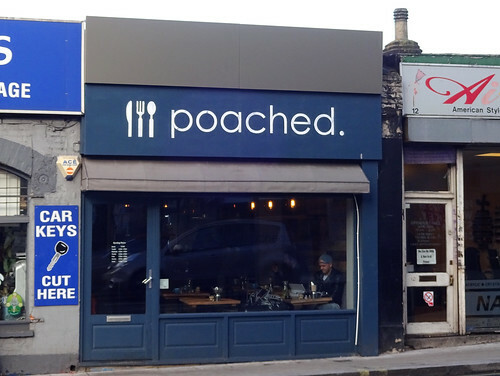 Sydenham's best vegan cafe, the Honey Hive, has had an update following a visit (alas featuring the most terrible vegetable of them all, in 'rice' form), as have the Fox On The Hill Wetherspoons in Denmark Hill and Brasserie Vacherin in Croydon. The Japan Centre has moved (yet again) just round the corner to Panton Street - its previous home in Shaftesbury Avenue now specialises in ceramics and books. Meanwhile further down Panton Street, the Odeon has closed, and is due to reopen at some point as a rather more 'luxurious' cinema. London Bridge's cinema/bar combo Roxy Bar and Screen has a less glamorous future: it is turning into a KFC. 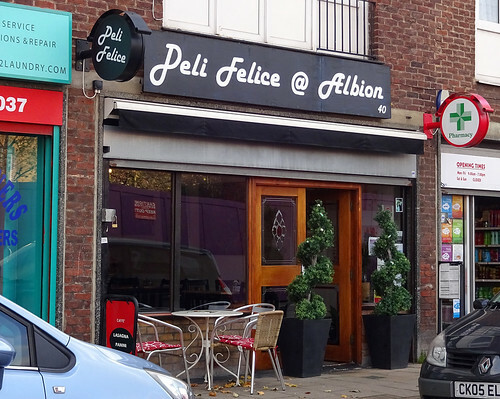 Finally, Croydon's fine dining scene is mourning the closure of Albert's Table (it's currently unknown whether or not it will become a fried chicken emporium, but if so they are welcome to take "Albumen EinstHEN's" as the best name I could come up with in 5 minutes). 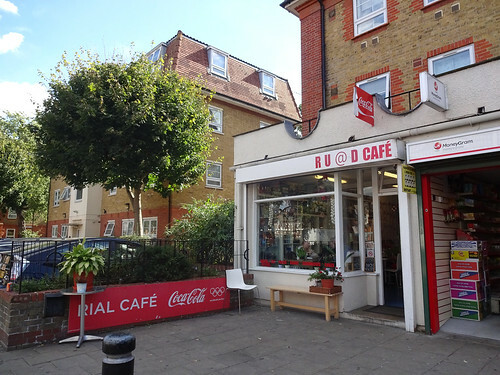 This week's featured article is Rial Cafe, E15 3BT, or maybe Ruad Cafe if you like. 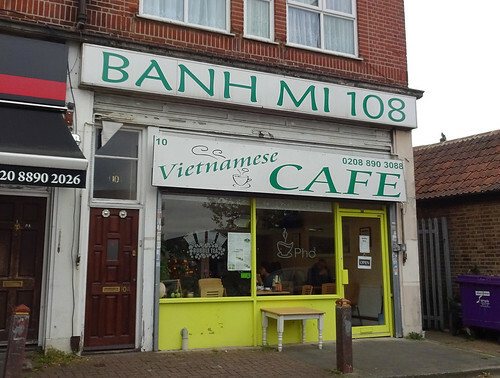 It's a cafe in West Ham with eclectic furniture and tasty lunches. 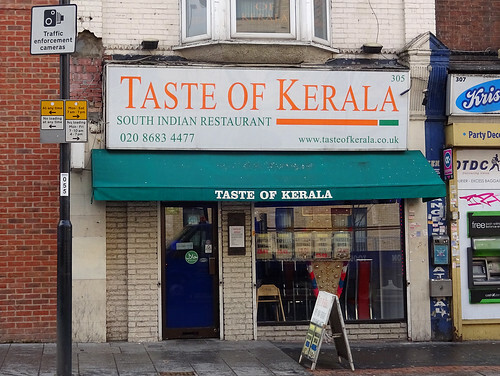 Our two additions are a MICROPUB in Anerley, the Douglas Fir (run by Gipsy Hill and is fairly minimal in decor, but good beers and WiFi), and Resham in Norbury (an Indian restaurant which specialises in Indian-style Chinese food). Three reported closures are The Belvedere Hotel in Belvedere (which is near Erith, if that helps? ), Beer Rebellion in Sydenham (short lived sadly!) and The Camel and Artichoke behind Waterloo station. Finally the very fine Claret Free House in Addiscombe is now called The Claret and Ale. 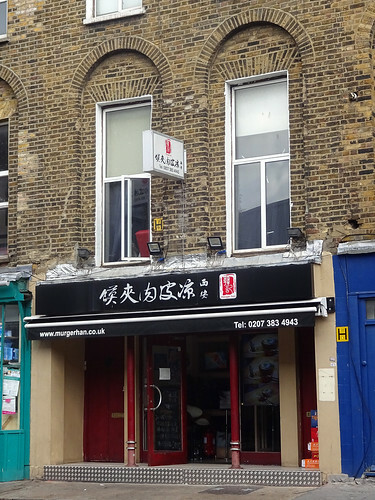 This week's featured article is Murger Han, NW1 1DA. 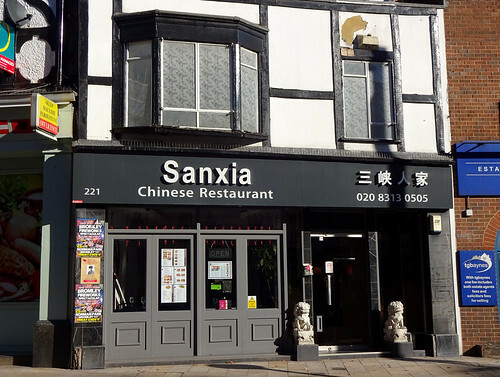 It's a Northern Chinese restaurant in Euston, and although I've never really been sold on 'Euston' as a descriptor of the area, I recognise most people probably know where you mean (this is really Somers Town, surely). Anyway, I'm getting distracted from the important thing, which is that for all its utilitarian decor, you can get some interesting porky fatty burger-type things (these it seems are the "murgers" of the name), and a nicely-balanced vinegary soup. Don't try and pay with Scottish currency, mind. One addition is a Nigerian restaurant in Canning Town, Squires, with decent thoroughly-cooked fish stew. There's an update to Napura, a Portuguese restaurant in Nunhead, from which you can also order takeaway. 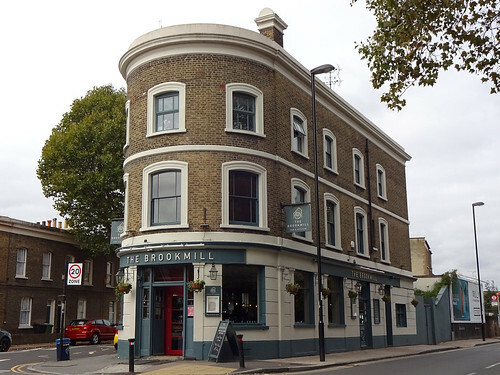 Two temporary pub closures are the Aeronaut pub in Acton, and the Great Northern Railway Tavern in Hornsey. Finally the reported permanent closure of East Dulwich tea shop Le Chandelier. Now a restaurant called Spinach, the idea of which isn't really thrilling me tbqh but I don't live in East Dulwich. Evening everyone! 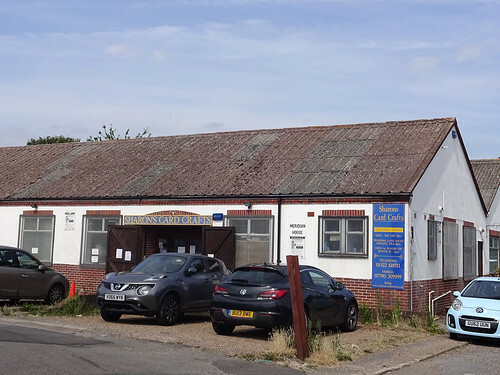 Our featured article this week is for "the best thing in Swanley", Sharon's Card Crafts. Behind the humble exterior lies all the papercraft supplies you could ever need. If you need to replenish your glitter stocks before the festive season, and you feel like going on an adventure to Zone 8, then this sounds ideal. 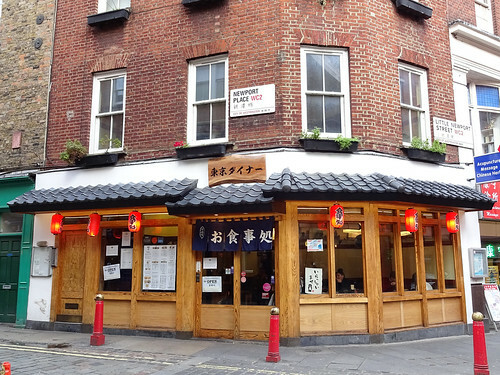 We have a new page for Murger Han in Euston, a cash-only Northern Chinese restaurant serving salty noodles and juicy dumplings, while the page for Khan's Indian restaurant on Westbourne Grove has had an update following a visit. It's reassuring to know they can tell the difference between prawns and king prawns - mollusc knowledge was a tie-breaker on University Challenge the other week, so you never know when you might be called on to identify crustaceans. Elsewhere, Italian restaurant Enoteca Turi has moved from Putney to Pimlico, while the Ravensbourne Arms in Ladywell has been rather abruptly abandoned by Antic, as they're shortly opening a different pub up the road. 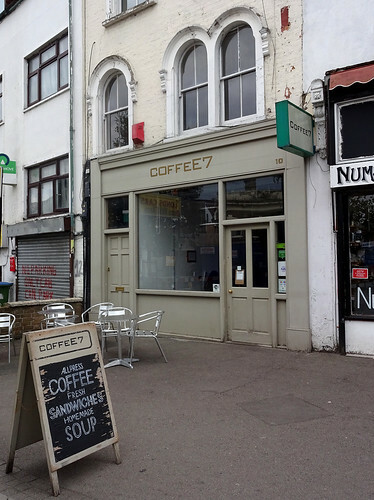 This week's featured article is for CoffeE7 in Forest Gate, a veggie cafe with mild TARDIS-like properties. It is part of the Suspended Coffees scheme, where you can pay for an extra coffee (or tea, or a sandwich), to be claimed at some point by whoever needs it. 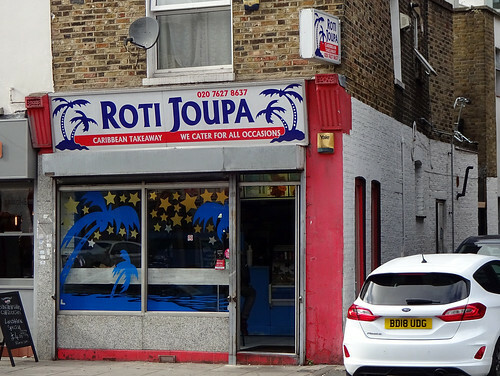 If you're after some quality Caribbean food in Finsbury Park, you could do worse than the subject of our newest page, Lulu's Caribbean Cuisine on Stroud Green Road. The menu has an entire 'Jerk Pit' section! I am fairly sure I saw Jerk Pit supporting my ex's mate's skatepunk band at the Bull & Gate in 1999. The nearly-alliterative BG Zakuska Bulgarian Breakfast in Barking has had an update, as has the Mute Swan pub near Hampton Court Palace. In Angel, One and One (it's had many names over the years; I will always know it as 'the vegan buffet place') has reopened after a refurb, but is apparently not 100% vegan these days, so do make sure your mock duck is indeed mock. Finally, the Devonshire pub in Balham is also having a refurb, and is due to reopen in November. Welcome to a new week on RGL! This week's featured article is Bus, CR0 2BQ. 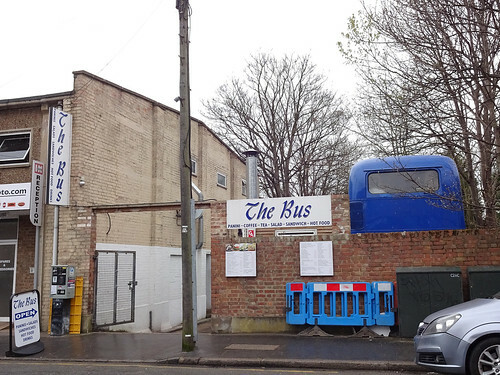 It is a greasy spoon cafe in a bus, up Selhurst way. It's child friendly. Also it's on a bus. 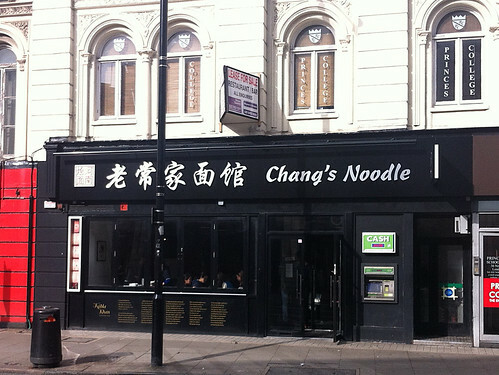 Four new articles are as follows: The Long Room in Tooting, a pub with relatively cheap food; Saravanaa Bhavan in Harrow, a branch of a vegetarian Indian chain, thankfully not too anglicised; Jen Cafe in Chinatown, specialising in hand-made dumplings, a quick turnaround operation with better meat than veg options; and Nusa Kitchen near Liverpool Street station, a fine soup-focused takeaway corridor. 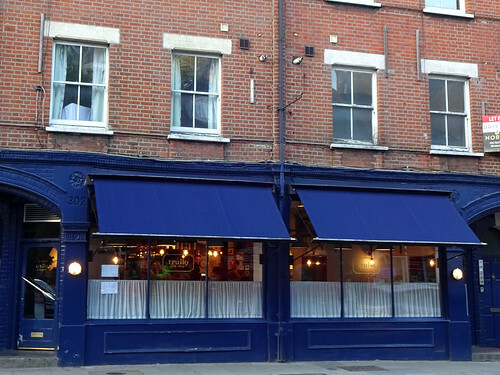 Finally, one reported closure is Oui Monsieur in Stoke Newington, a short-lived French bar/restaurant.